Foam and dancing seem to be two things that don’t go together. Dancing is great exercise and it’s easy to break a sweat while doing it. Foam is fun and it cools you down. The question might be why not put foam and dancing together? Dancers will be contained in an inflatable dance floor where foam is plentiful and constantly moving around. Add music and you have yourself a dance party! Foam dance parties became popular in the electronic music scene and have expanded from there. A foam dance party turns your backyard into a club! These are just some suggestions of great songs that remind us of, well, soap! If you’re worried about safety, all of our activities are supervised by our staff, so we can ensure all equipment is properly functioning during a party for the safety of your guests. You can provide your own music or for an additional fee, we can set you up with a professional DJ. Our foam parties are also available in two size basins- large or extra large. Whatever you choose, we promise you’ll have a blast at your foam dance party! If you have ever wondered what it’s like to be a stuntman on a Hollywood film set, you’ve come to the right place. Our company brings the party to you with all sorts of amusement rentals including Sky Fall. Sky Fall simulates what it’s like for a stuntman to fall from a building, seemingly a dangerous fall. The good news is that the stuntmen (and you) will fall right onto an air bed below them. This attraction can be an exciting thing for any group at a variety of different occasions. It’s perfect for a Hollywood themed party where you can literally feel what it’s like to be in the movies. Maybe someone who is graduating is heading from the East coast to Los Angeles. Perhaps the person of honor at the party just really loves action movies. The Sky Fall is just plain exciting! The thing that keeps stuntmen safe is what is called “zero shock technology.” This brings your experience to life on your day as a stuntman. This technology is the most advanced shock absorbing technology in the world. This feature allows every jump and every party goer to be safe while having tons of fun. DJ Phantom has experienced staff to help keep you and your guests safe at every one of your events where you rent some of our entertainment equipment. Contact us for your next fun event! November 2015 Specials…get ’em before they’re all booked up! Phantom Entertainment is running some specials for the Month of November 2015. 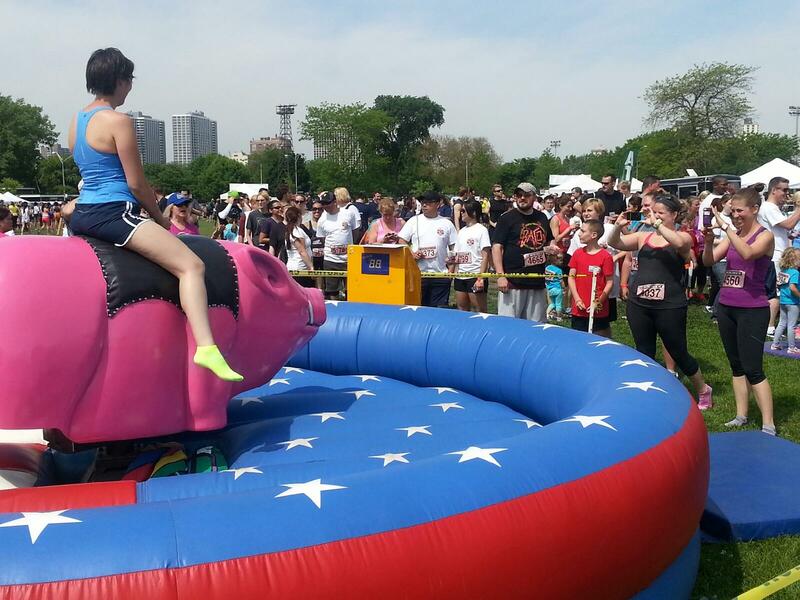 Mechanical bulls are priced at $800 for up to 4 hours. This price includes Harley The Hog, Great White Shark, Hammerhead Shark, Touchdown Tumble, Football Helment, and Whirling Wizards. Units are available for up to 4 hours on any date in November. Travel and lodging may be additional depending on your location. Our bull systems require 2 dedicated 110 Volt, 15 Amp AC circuits and dimensions of 16ft x 16ft area. Mobile Zip Line is specially priced at $1895/up to 4 hours. Get this unit reserved quick before someone else does! Requires a 30ft x 200ft area. This is fun for all ages and does not require any electric to operate. Again Travel and lodging apply to your event location. Finally, the Skyfall Stunt Jump is being offered at the low price of $1500/up to 4 hours. Continue reading November 2015 Specials…get ’em before they’re all booked up! Posted on October 19, 2015 Categories UncategorizedTags Mechancial shark, Mechanical bull, Mobile Zip Line, Stunt Jump, Zero Shock Stunt JumpLeave a comment on November 2015 Specials…get ’em before they’re all booked up! 2015 will be a big year for Phantom Entertainment’s new items. Phantom’s new Battlezone is an amazing high rise jousting experience. 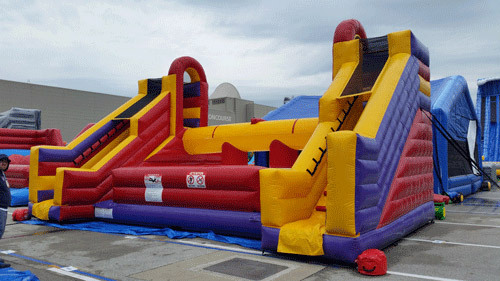 At 30ft long by 20ft wide, this unit can be the center piece of any event. Two participants climb their stairs and then meet at the middle of the yellow tube. The Battlezone is available now. Throughout history, a jousting beam, in one form or another, has provided wild entertainment and competition for thousands of fans and competitors alike. become a free-for-all with everyone wanting to take down the ‘King-of-the-Hill’. Battle zone, the amazing high rise jousting game. KAPOWIE is a multi-player game where participants race against each other through a circular inflatable obstacle course with rotating boom arms, that comes into contact with the player at knee/thigh level. Each player will have their own lane, until the final straight whereboth players race to the finish line. Kapow is an incredible obstacle course with moving parts. The bright green contrasts beautifully with the black, grey and yellow for a vivid toxic meltdown theme. Meltdown is a fun game for the whole family. Posted on February 10, 2015 February 10, 2015 Categories UncategorizedLeave a comment on 2015 will be a big year for Phantom Entertainment’s new items.